State Representative Gene Wu has pre-filed legislation for the 85th Legislative Session to ensure that the Texas Juvenile Justice system works better to rehabilitate young offenders and end the school-to-prison pipeline. The primary legislation to reform the Texas Juvenile Justice system is House Bill 676 (H.B. 676) to raise the juvenile jurisdiction age, or the age when a person will be considered an adult, to 18 years of age. This change would bring Texas’ policy in-line with the vast majority of states and the federal justice system. Texas is one of only a few states remaining in the nation that still treats children between the ages of 17 and 18 as adults for all crimes. When Rep. Wu filed this legislation in the 84th Session, Texas was of nine (9) state left that had not made this change. As the 85th Session is about to begin, Texas is now one of seven (7) left. H.B. 677 – would allow a judge, following a hearing, to seal a juvenile’s Determinate Probation records. This bill is intended to give juveniles placed on long probations for more serious offenses a chance to seal their records, if they perform admirably during their probation. H.B. 678 – would allow an associate judge to take part of a determinate sentence plea; freeing the District Court Judge to perform other duties. This bill is intended to improve administrative efficiency. H.B. 679 – would ban the use of heavy mechanical shackles on juveniles unless it is specifically ordered by a judge. This bill is intended to curb the instances of chain shackling juveniles as young as 10 years old, when they do not pose any real threat. That’s the reason that two-term state Rep. Gene Wu gave the editorial board to explain the political momentum in the state House to fix Texas Child Protective Services. Democrats, like Wu, and Republicans are working together to file bills for the upcoming session that will provide better pay for CPS workers, more money for foster families, and better therapy for kids and drug treatment for parents who need it. As a lawyer who takes CPS and juvenile law cases, Wu is an invaluable resource on this issue, and voters should give him a third term in Austin. “Bill O’Reilly and Jesse Watters have tried to downplay this segment as just good old-fashioned humor, but I have spent my entire adult life trying to push back the casual racism that they find so funny. Their piece was obviously racist and perpetuates harmful stereotypes against all Asian Americans. The Asian American community is one of the last populations where American society still tolerates this type of bigotry. I can’t imagine that O’Reilly would dare pull this stunt in an African American or Hispanic community, without risking widespread condemnation. The Asian American community has fought too long to overcome these gross stereotypes to allow this to go unchallenged. This segment also makes plain what Republicans and conservatives really think of the fastest growing immigrant community in the nation. I hope Asian American voters will remember this in November. Representative Wu is an Asian American elected official who represents House District 137 in the Texas Legislature. HOUSTON, TX – State Representative Gene Wu expressed frustration and disappointment at the recent announcement made by Governor Abbott that the State of Texas would withdraw from the federal refugee resettlement program. For the past 40 years, Texas has administered the federal program through various local organizations, and in the last five years has resettled more than 40,000 refugees, surpassing all other states. Refugees go through an intense security screening process before being admitted for resettlement. Even in the absence of Texas’ cooperation, federal officials will work directly with local organizations to distribute the federal funds and ensure resources are available to assist refugees resettled in Texas. Houston alone is home to over 70,000 refugees from 79 different countries, and it resettles more refugees than any other city in the United States. Many refugee families reside in Texas House District 137 in Southwest Houston, along with numerous organizations offering programs, services, resources and support. “Texans are compassionate and hospitable people, and our state has a long and proud history of helping refugees,” Wu said. “At a time when the most vulnerable people in the world need help, we should not turn our backs.” Interfaith Ministries for Greater Houston, Catholic Charities of the Archdiocese of Galveston-Houston, Alliance for Multicultural Community Services, Refugee Services of Texas, YMCA of Greater Houston, Bilingual Education Institute, and Partnership for the Advancement & Immersion of Refugees are only some of the organizations working in Houston to assist refugees. This is truly a history making day. This day’s significance will only be second to one in January 2017, when she is sworn in as the first woman President. Congrats Hillary. Graduating from high school is an exciting and important milestone. Nearly 10,000 high school seniors from across the Houston Independent School District will receive their diploma this week. We congratulate all of our graduating seniors for this achievement, but I’m especially proud of the students in District 137. Every graduating senior received a personal letter of congratulations from our office, celebrating their achievement and wishing them the best as they embark on the next chapter of their life. Additionally, we gave special recognition to the top two scholars from HISD schools in Southwest Houston. The following students graduated at the top of their class as the valedictorian and salutatorian. We couldn’t be more proud! District 137 includes parts of Houston ISD and Alief ISD, both of which are characterized by the diversity of their student populations. Alief Superintendent H.D. Chambers has been a leader in transforming public education to meet the workforce needs of tomorrow. Chambers offered his insight on the challenges we have as a state to educate 5.2 million children and also spoke about the significant reforms enacted during the 2013 legislative session. Freddy Warner, System Executive for Memorial Hermann Healthcare System and Januari Leo, Government Relations for Legacy Community Health Services both discussed issues surrounding public health. Memorial Hermann is the largest health care provider in the region and Legacy has three clinics in District 137 that provide a full range of services for the uninsured and underinsured in our community. Warner discussed the cost of health care and the burden on hospitals in providing indigent care for Texas’ large uninsured population and gave an overview of the funding battles over how the state pays for our health care systems. Leo talked about the different programs and services offered by Legacy. Both Warner and Leo discussed the impact of Texas’ refusal to expand Medicaid and the overwhelming strain it puts on our hospitals, clinics and healthcare system as a whole. Celena Vinson, Assistant County Attorney discussed nuisance abatement through civil lawsuits and the different tools that can be used to fight illegal game rooms, gang activity, human trafficking, and other related crimes. Houston Police Lieutenant H. H. Conn talked about law enforcement efforts to build relationships in the community and the support her officers receive in return. The following op-ed appeared in the Houston Chronicle on February 25th. Bipartisan support isn’t something you hear very often in Washington, D.C., but in Texas we understand the importance of working together to support efforts that will benefit the Texas economy and add jobs. Liquefied Natural Gas (LNG) exports are an opportunity to do just that. Thanks to the shale boom, the United States has moved from a position of energy scarcity to a position of strength and abundance. By liquefying surplus natural gas supplies and exporting it to allies overseas, the U.S. is able to solidify its place as a global energy provider while at the same time creating jobs at home and strengthening our own economy. Texas is uniquely positioned to become a leader in the next chapter in America’s energy transformation due to our abundant natural gas supply, infrastructure and access to deep water ports. According to studies, LNG exports will create up to 155,000 Texas jobs in construction, operations, exploration and production by 2035 and contribute up to $31.4 billion to our local economies. The benefits of LNG exports are not just confined to Texas. LNG exports are expected to generate as much as $86 billion in net benefits to the U.S. economy and help create up to 2.4 million American jobs by 2035, according to a recent report from NERA Economic consulting. Additionally, a 2015 peer-reviewed study by Carnegie Mellon University found that exporting LNG from the U.S. to Asia or Europe can help reduce greenhouse gas emissions compared with burning coal. LNG exports will play an important geopolitical role as well. For decades, our allies abroad have been dependent on countries that are politically at odds with U.S. interests in order to meet their demand for natural gas. Now that the U.S. has an abundant supply of natural gas that can be offered to our allies, we have the ability to weaken the stronghold that countries like Russia and Iran have on those countries while at the same time strengthening our own domestic economy. This past legislative session, we were the sponsors of a resolution urging Congress to expedite the permitting process for natural gas exports. The measure, SCR 32, passed without opposition and was signed by Governor Abbott. Currently, costly and time-consuming regulatory limitations hinder the trade expansion and job creation that LNG exports are able to provide. Under the current process, license applications are delayed or backlogged at the Department of Energy. This hurts hard-working Texans who will benefit from good-paying jobs and also prevents America from taking a leading role in the world market. An update to our policies is long overdue. The energy bill currently working its way through Congress includes provisions that would help increase regulatory certainty for economically viable LNG export projects. The proposed legislation imposes a deadline for the DOE to review and act on export permit requests to non-free trade agreement countries following final environmental approval by the Federal Energy Regulatory Commission. Most of our allies clamoring for U.S. natural gas – Spain, Lithuania, France, etc. – do not currently have a free trade agreement in place with the United States. During this time of uncertainty in commodity prices, LNG exports still provide a bright spot for the energy industry that will create economic growth opportunities for hard-working Texans and businesses. We must not delay an opportunity to reinvigorate the energy markets, create jobs and provide our allies with a clean and reliable source of energy. As Republicans, Democrats, and Independents, we must continue to call on Congress to address this important issue of a burdensome permitting process. The Texas way is a recognition of the obvious: that we must allow the United States to realize its full potential as a global energy leader with LNG. Bettencourt is a Republican Texas state senator from Houston. 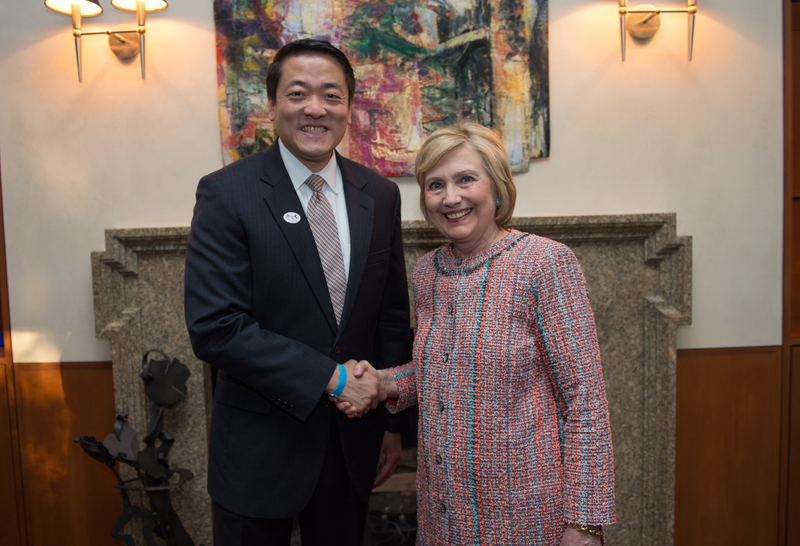 Wu is a Democrat representing Houston in the state House of Representatives. The Democratic Primary is just one month away. I’m honored to have the support of my colleagues in the Legislature, as well as many local leaders who have offered their endorsement of the work I’ve done for District 137. None of this would have happened if I didn’t have your personal support. The reception I’ve gotten from voters as I go door-to-door in the district has been phenomenal and it is all due to the strong support shown by friends, constituents, and neighbors who believe in what we’re doing. It’s not too late to get involved and help us cross the finish line on March 1st. 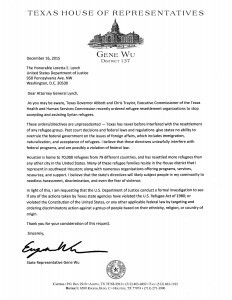 Houston, Texas―State Representative Gene Wu announced today that he has sent a formal request to the U.S. Department of Justice asking that they investigate whether any Texas agency has violated the US Refugee Act of 1980, or if any Texas agency has violated the US Constitution or federal law by specifically targeting a group for discrimination based on their ethnicity or country of origin. Houston is home to over 70,000 refugees from 79 different countries, and resettles more refugees than any other city in the United States. Many refugee families reside in Texas House District 137 in Southwest Houston, along with numerous organizations offering programs, services, resources and support. The Alliance for Multicultural Community Services, Catholic Charities of the Archdiocese of Galveston-Houston, Refugee Services of Texas, YMCA International Services, Partnership for the Advancement & Immersion of Refugees — all of whom have offices in District 137 — are only some of the organizations working in Houston to assist refugees.